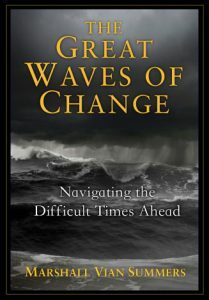 There are growing numbers of people in the world today who sense that great change is coming, and more than this they have begun to respond to messages from Knowledge, the deeper intelligence within them telling them to do certain things, to make certain adjustments or changes in their lives and to take certain forms of action. All this requires humility, of course, and the willingness and the commitment to set aside assumptions, prejudices, preconceived ideas and so forth. To see and to hear truly, you must have this approach. But you must look earnestly, and you must listen earnestly. You must commit yourself to seeing and to hearing. It is not a casual pursuit you do once in a while. It is not something you do periodically, just to have a look or have a listen. It is what the animals do. They are always looking and listening, for there is danger, and they are equipped to respond to it, or they could not survive. The real question in preparing for the Great Waves is whether you can see them, hear them and feel them and whether you can take the many steps that the preparation may require. Nothing else matters—your political viewpoint, your social standing, your evaluation of yourself, your interests, your hobbies, your friends, your associations, your talents, your skills. If you cannot see, know and respond, none of these things will help you now.